Deyuan celebrates International Women's Day on March 8The annual International Women's Day is coming!Deyuan has prepared beautiful flowers and gifts for each member. Everyone gathered to enjoy the cake to celebrate.Wish every lady a happy holiday! Brief Introduction Of Marine Power Equipment The ship must be equipped with a complete set of power units and auxiliary equipment that meet the requirements of the specification before it can sail on the water. These power units include ship main power units, auxiliary power units, steam boilers, refrigeration and air conditioning units, compressed air units, marine pumps and piping systems, water generators, and automation systems. 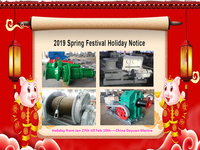 This electromechanical power plant is mainly concentrated in the engine room, and the technical department that manages these equipments exclusively is the engine department.